I have a confession. I’m watching VH1’s, “I Love the New Millennium” series right now. Hey, the Red Sox already lost earlier tonight, and I’m fresh out of DVR’d shows that interest me, and I just packed up the last Netflix DVD i had at home. So the episode is featuring 2005 and I am chagrined to note that a lot of what is featured is new to me. I attribute this to my being pretty well wrapped up in parenting young children, which leaves precious little timee for digging pop culture. But if you think that’s bad, JFK was shot when I was 8 months old, and my mother says she remembers very little aside from the very day for the same reason. Anyway, I had to share this video which had me drop-jawed. I have never heard of the group or the song, but it’s pretty cool. What do you remember from 2005? Krystal is a girl who likes to talk. Actually, both my girls are in love with the sound of their own voices. As a person who enjoys solitude and quiet, this is a struggle for me at times. Lately Krystal has been asking way more questions than usual. Or maybe it’s just the nature of her questions that I’m noticing more. I know she’s just trying to make sense of the world, understand the dangers that are out there and how she might navigate them. But it’s still disconcerting to hear a 7 year old ask so many questions about what you can die from. I may be one of the last people in the country to see the movie Juno, but I finally saw it last night. My mother had told me how much she loved it, as well as my closest friend (who I feel compelled to add is both an adoptee and an adoptive mother). I had also read mini-reviews by a few others in the blogosphere who called out its appalling treatment of birth mothers, and so I went in with my antennae up on that. If you haven’t seen the movie yet, many of my comments below may not make sense, and will contain spoilers. Read at your own peril. First, I didn’t hate the movie. There were some things I even liked (I love “Arrested Development”, so just seeing two of those characters was a huge treat). But. I HATED that Juno never even considered raising her baby herself. While no parent would want to hear that their 16 year old daughter was pregnant, they were good and supportive parents overall – they could have (and to my mind, should have) offered help and support to her to raise this baby. The movie does explore abortion, which Juno first considers and then decides against. As a staunch pro-choice advocate, I was pleased at the matter-of-fact way this was handled. But the automatic next option for her was adoption, with no apparent consideration for parenting. In the 21st century, I’m not sure how realistic this is, and I think the movie loses some credibility, as well as an important dimension, by not at least addressing it. From a family support standpoint, Juno’s step-mother and best friend accompanied her to her ultrasound appointment which to me underscored her family support – her stepmother held her hand and laughed with her in amazement at the images on the screen. She also dressed down the ultrasound tech who made a very inappropriate comment when she learned Juno was choosing to relinquish. Most of what I’ve read about this movie seem to paint it as pro-choice/pro-life, depending on your politics, with the adoption stuff completely ignored. To me it painted birthmothers very widely with a brush most of the world would LIKE to see – as incubators for perfect little babies for someone else. Several other posters have commented on the racism exhibited in the film – the protester at the abortion clinic is Asian and is presented in a dorky way, the ultrasound tech is evil and Juno makes a disparaging comment about Chinese adoptions. I don’t feel qualified to address the first two, but I’d like to add my take on the Chinese adoption comment, especially because I have adopted two Chinese children myself. I did not see Juno’s comments as racist, or anti-adoption, but a flippant reflection/obvious exaggeration of what a contemporary teenager probably thinks about Chinese adoption. It was said in such a way as to be patently untrue. C’mon, shooting babies out of T-shirt cannons at sporting events? I honestly have a hard time being offended by something intended to be outrageous. I was disturbed that Bleeker, the baby’s father, chose not to see the baby, and that this was presented as a good thing, and that Juno and Bleeker quite literally returned to “normal” life after the birth and adoption of their son. How many birth mothers do that? Not too many that I’ve been in contact with. Try none. So there you have it. In short, my opinion would have to be that Juno is a quirky movie about an independent teenager who finds herself in an adult situation without the maturity to deal with it. Oh, and can anyone tell me why everyone was using corded phones?? I actually wondered if maybe it was intended to be set in the 80’s, but it wasn’t. We are fortunate to live within a 5 minute drive of a baseball team in the Can-Am league. Don’t get too excited – while these are professional baseball players, they are not in the MLB farm system, and therefore are probably at the top of their own personal game. I shouldn’t make it sound so disparaging – after all, I’ll never play at that level, nor will anyone I know in real life. And it is really cool to be able to go to a baseball game anytime we want. Here we are at the game! The games are very family-friendly, with a “Kid Zone” on the left field line, inexpensive tickets ($4-$10), reasonably priced concessions, free parking, occasional cool promotional give-aways and fireworks nights. Gosh, when I write it all out like that I want to shout from the rooftops how lucky we are! 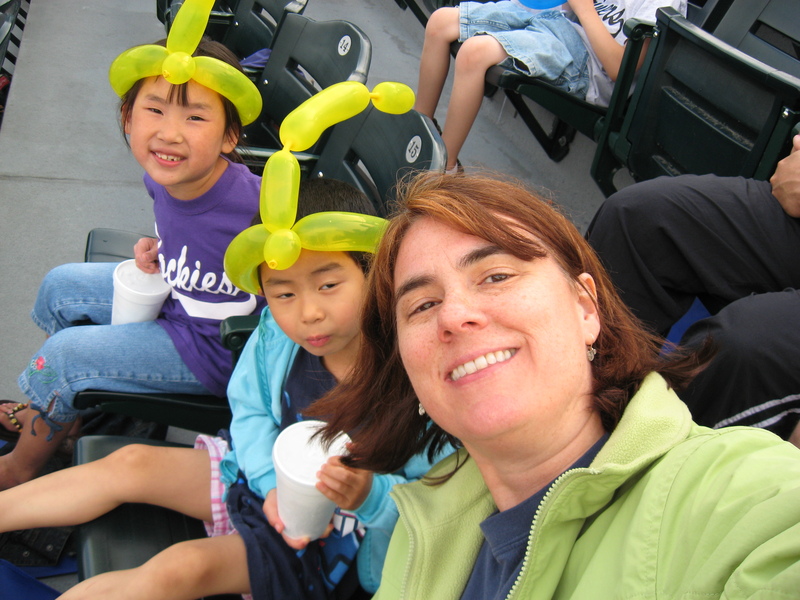 Anyway, yesterday afternoon was the finale event for Krystal’s rookie year playing in our local Cal Ripken league which was a make-your-own sundae event outside the stadium, and then a baseball game. All for the bargain price of $4 each. The weather earlier in the day had been dicey – a wicked thunderstorm moved through mid-afternoon, and I wondered if the game would still be on. It was, albeit under still-threatening skies. It actually rained twice ever-so-briefly during the game, and during the second spell we were in the stands with jackets over our heads, while the pitcher stood on the mound in sunshine. And you know what that means! The rainbow was particularly cool – it started out on the right as shown in the photo, turned into a full rainbow, then a double on the right, then faded to be stronger on the left, until finally disappearing. It was the most dramatic rainbow I have ever seen. The girls both enjoyed themselves and the home team won, 10-6. Top that! Another meme – sorry, it’s summer around here. 1. Ferris Bueller’s Day Off – a modern classic….or maybe it’s not modern anymore? 4. Enchanted – if you have not seen this yet, see it! it’s fantastic! I don’t know – did you learn anything new about me? Spark anything interesting about yourself you’d like to share? A meme! A meme! And this time I didn’t have to take it upon myself, but I was specifically tagged for this meme! By someone who actually reads my blog! I feel so popular! Like Steve Martin in “The Jerk” (“The new phone book is here, the new phone book is here”, in case anyone missed the reference). OK, I can do the first four, but I will not be performing Rule #5, part a (part b is already done). But hey, if you’re reading this and would like to participate, please consider yourself tagged. And I mean that in the nicest of all possible ways. Fifth sentence: But railing isn’t healing. Sixth, seventh, eighth: Healing is another story. The first step in healing is telling the truth. When you tell the truth, you acknowledge your losses. This is from When Food is Love, by Geneen Roth. It’s the book I grabbed off the bookshelf next to the desk where I am typing this. I’m not currently reading it, but I have read it, and it really spoke to me. These sentences are really exposition sentences – she hasn’t even gotten into the meat of what she has to say on this page – that comes a paragraph or two later. As someone who has “issues” with food, I highly recommend it to anyone else who has them. Today was the last day of first grade for Krystal. I welcomed her off the bus by calling her a second grader, which thrilled her. Ah, the simplicity. I’ve been wracking my brain for several weeks, trying to think of a sustainable “Last Day of School” ritual that we could start. In the end, I fell back on the one I grew up with, that we continued mostly by virtue of inertia. And even though I brought my camera with me, it wasn’t till we were just about done that I remembered it hanging off my body to take a photo! Yep, that was dinner. We’ll see if it becomes a yearly tradition right around this time next year. Unless you Internets can come up with something we like better!